There are a few UI issues i've found. I've passed this long to D-Link for review. I presume they will have a look at this Monday. If you need too, you could revert back to v2.04. I presume this issue will take some time before we see a fixed release. 2.04.03 is where it started for me. I'm curious on your mac, specifically: Are your months missing in playback? Have you tried to reinstall 2.05? Looks like this issue was reproduced at D-Link and is now under review for fix. Hopefully soon. Please be patient. I've been using this patch for a while now and it works without any problem except the UI has all this goofy sample text instead of real menu values such as "System Restart Btn" for reset after setting change button. Pretty much all the menu items are labeled in Java style camelCase. I can figure them out since I do software development but to release this to customers like this is kind of sad. Please polish it off and release an official update since this patch isn't even what comes up when going through the DLink website's "find updates". 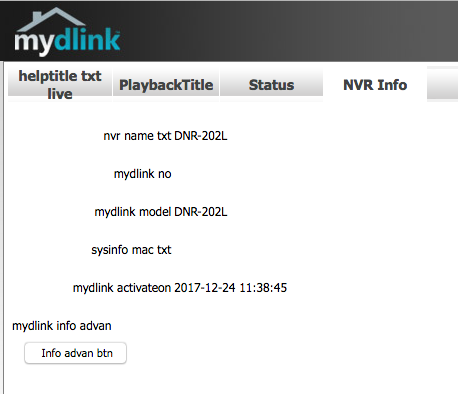 Is this in the DNR-202L UI or mydlink.com? We installed the 2.05 firmware and the web UI is OK in IE11. Going to test other browsers later today. Also, BETA firmware are not pushed through the mydlink server. You'll need to contact D-Link Canada about that. The update file listed here is for the USA. However is available for use for Canadian users to try. USA and Canada handle there own files and support sites. D-Link Canada discontinued this product a while ago but should be posting security firmware (unless they found issues with it and removed it). I will contact them tomorrow morning.